After the last Variable EQ phono stage for 78rpm records I always wanted to build one with switchable LCR EQ. Here it is. Bernd Hemmen and Wolf von Langa with whom I will set up a system at the upcoming High End show again, came up with the idea to do 78rpm demos similar to the one at the ETF in Berlin. 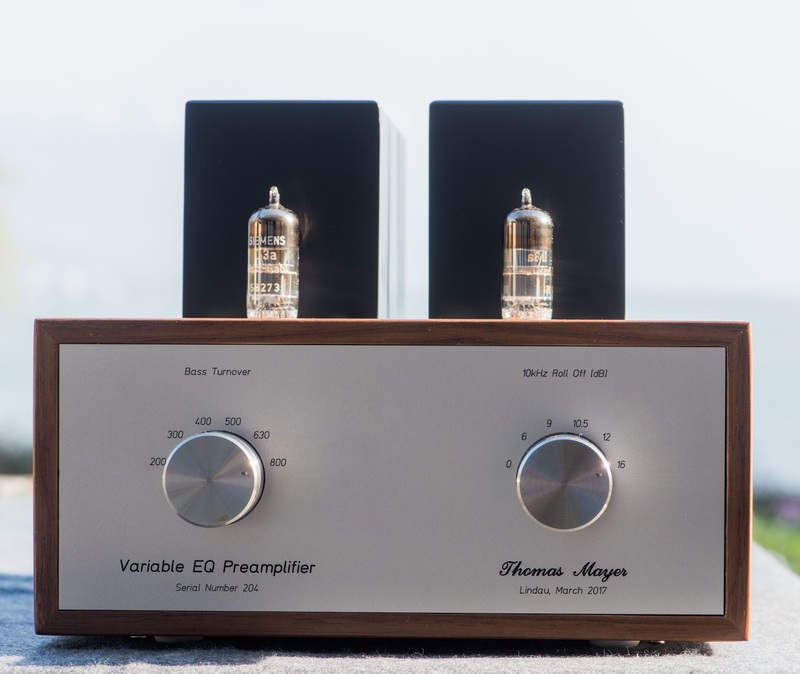 A good reason to develop a new variable EQ preamp for such an event. 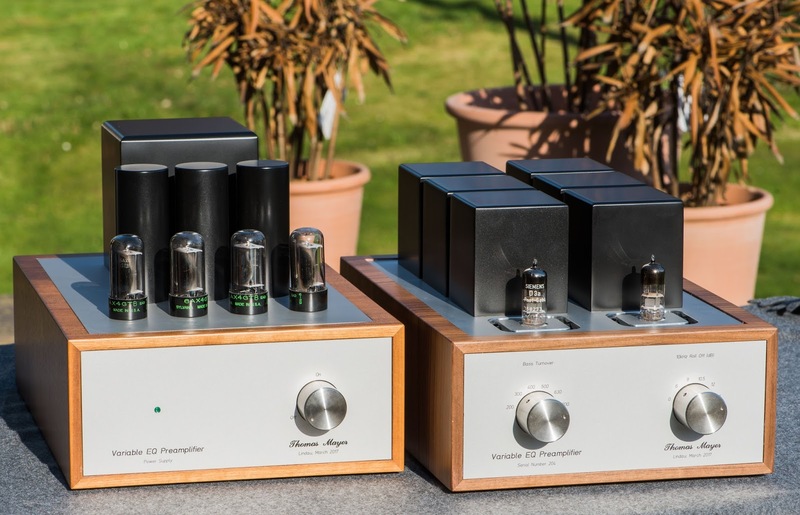 This time with D3a tubes and based on the same fully transformer coupled circuit as my D3a LCR RIAA phono stages. 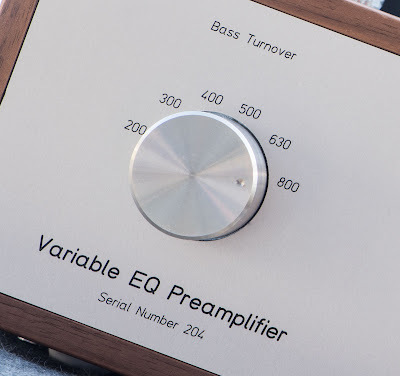 Only mono this time and with separately adjustable bass turnover frequencies and treble roll off. 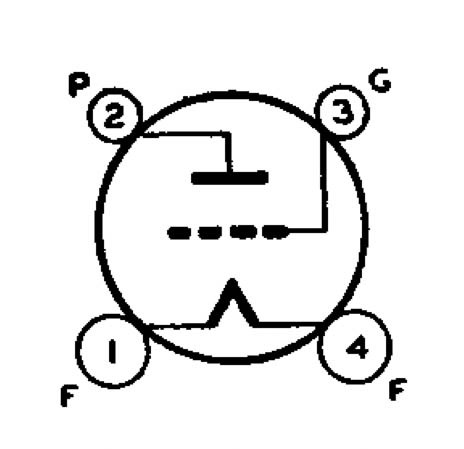 The last implementation had too many settings with 12 positions for each. 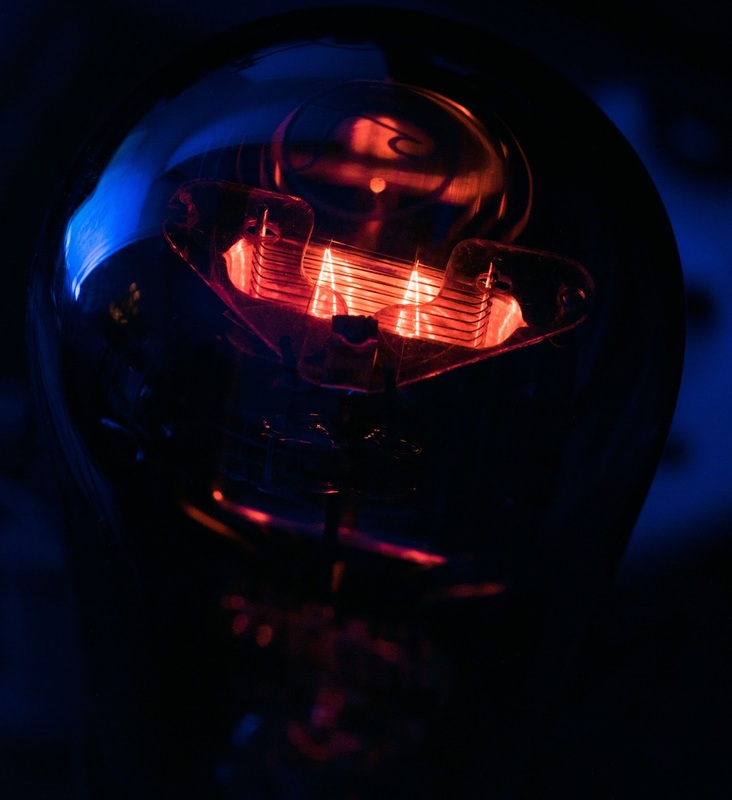 This time I reduced to just 6 settings each. 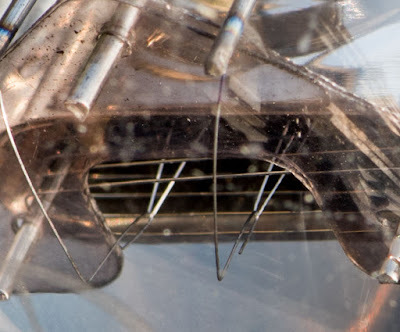 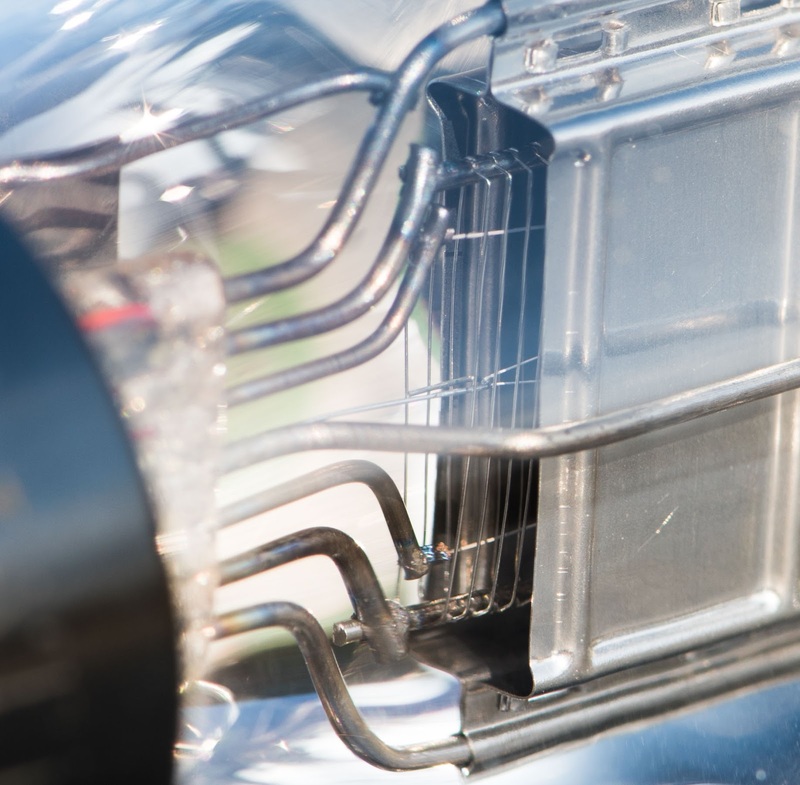 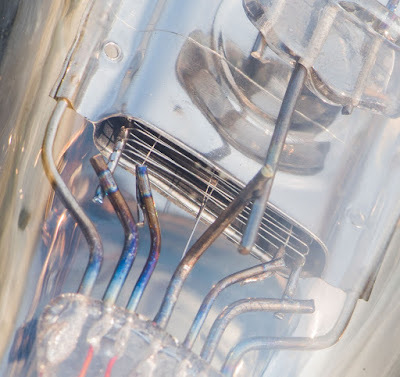 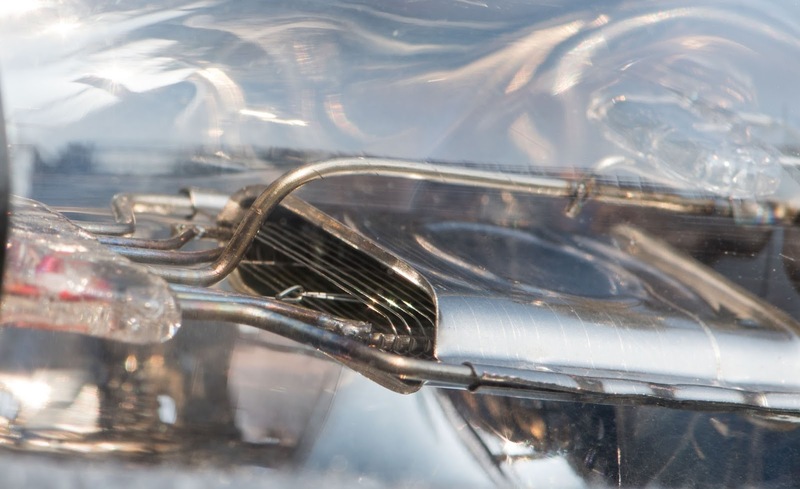 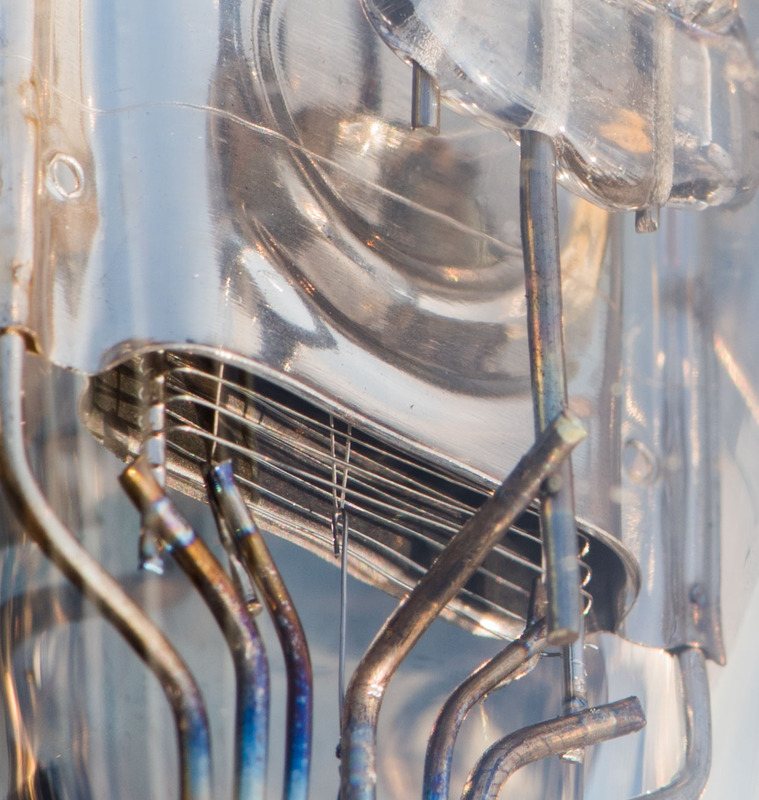 The two D3a tubes are placed at the front and part of the chokes and transformers of the circuit are placed on top under transformer covers. 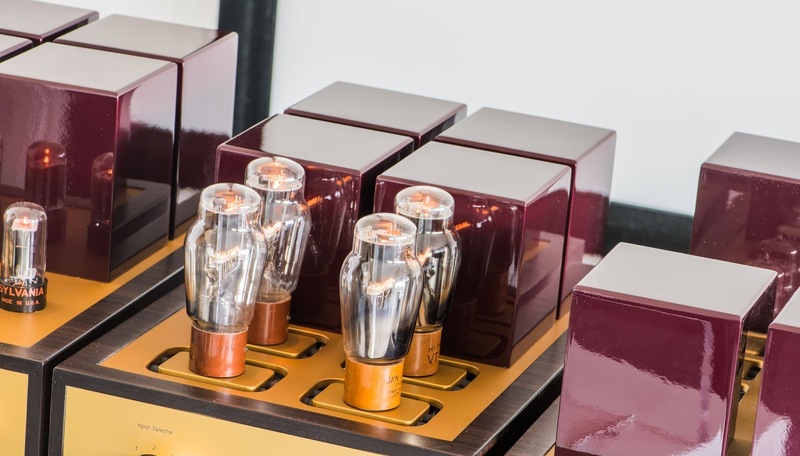 Visit us at the High End fair and join us for a journey through the history of Jazz on 78rpm! 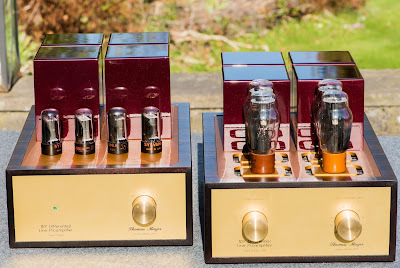 In the last post about the ultimate line preamp I showed the work in progress on the latest build. 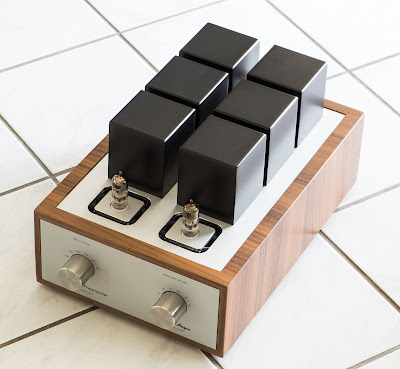 Now it is finally finished. 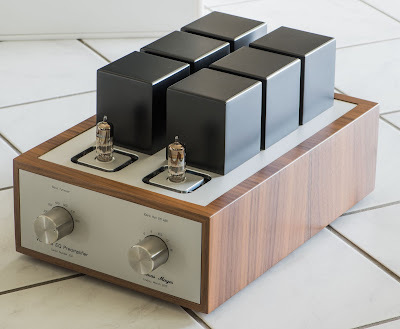 Unlike the last three builds this one will stay in my system. 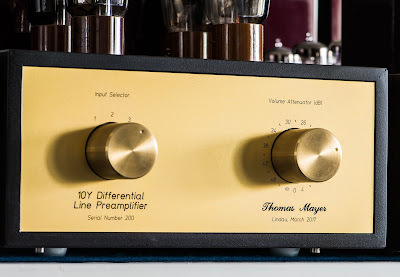 Finally I get to enjoy this preamp for myself! 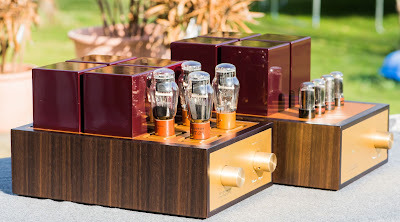 It has the same color combination as my ultimate phono stage. 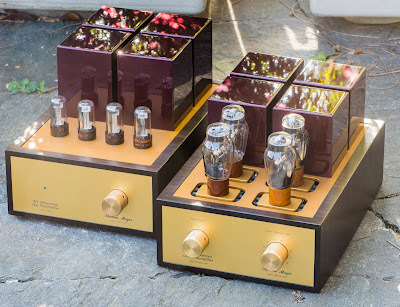 This combination will stay in my system, as my main demo preamp. 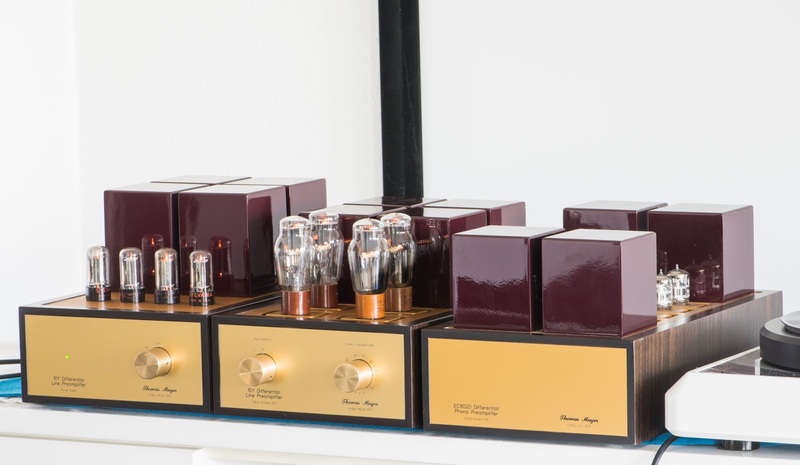 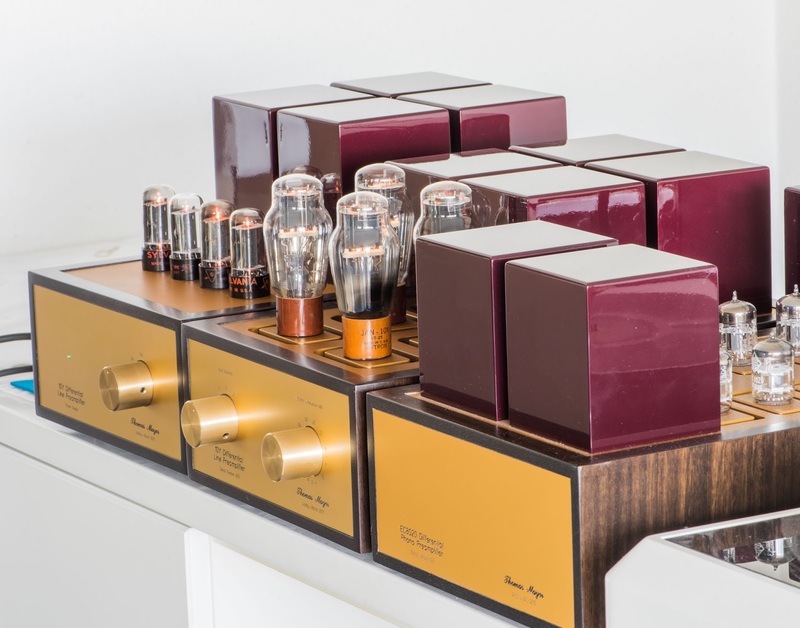 It will also be on demo at the upcoming High End fair in Munich. It has three inputs, of course it can also be built with more inputs if needed. I already wrote about the sound in previous posts about this line stage so I am not going to bore you with more superlatives. Together with the EC8020 differential phono this represents my ultimate statement in preampfification. 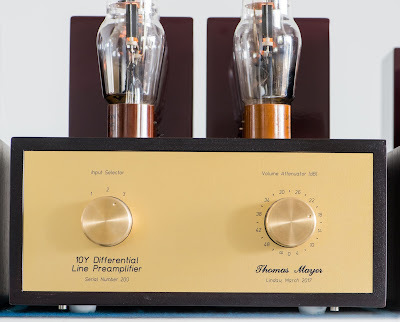 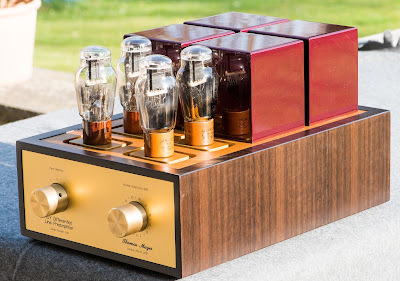 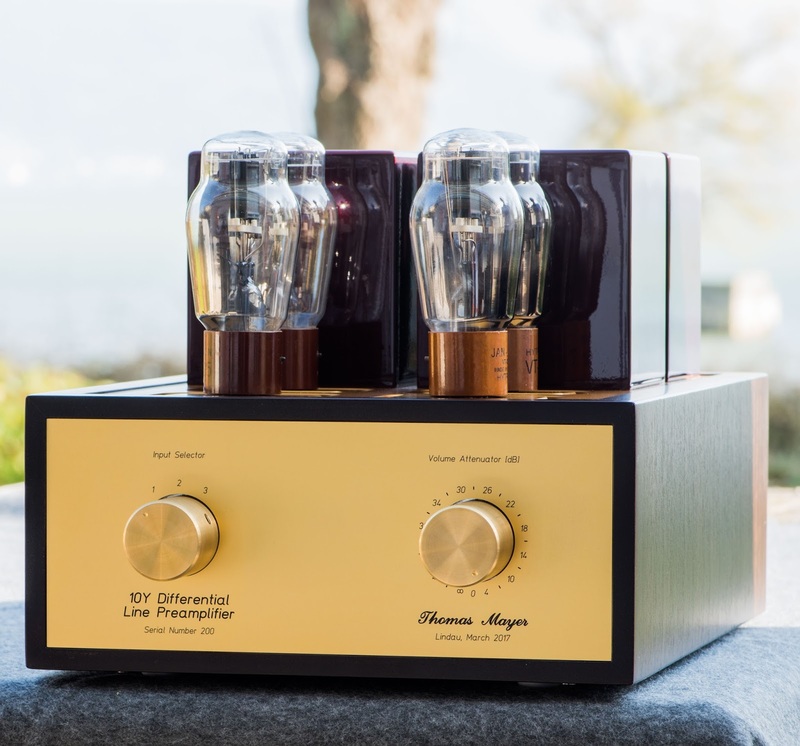 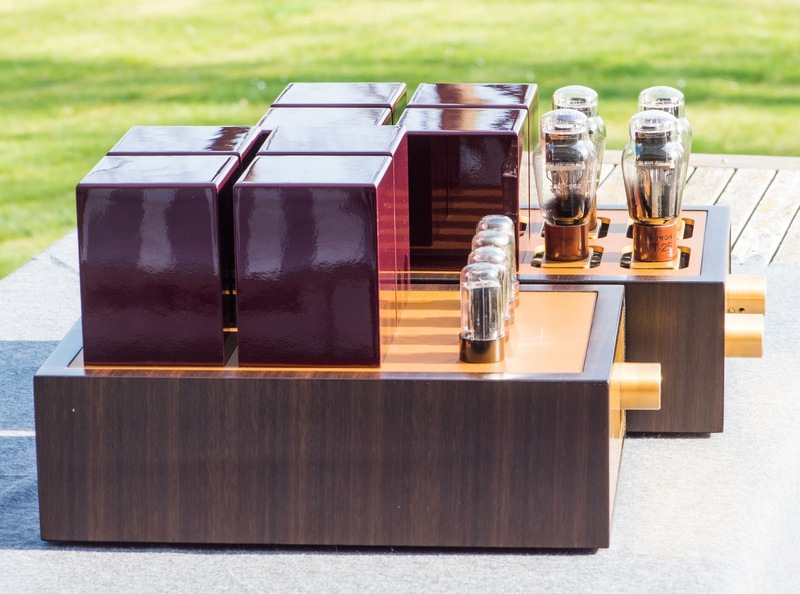 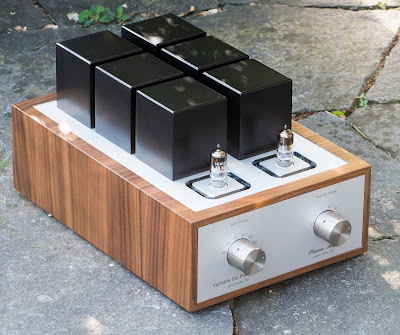 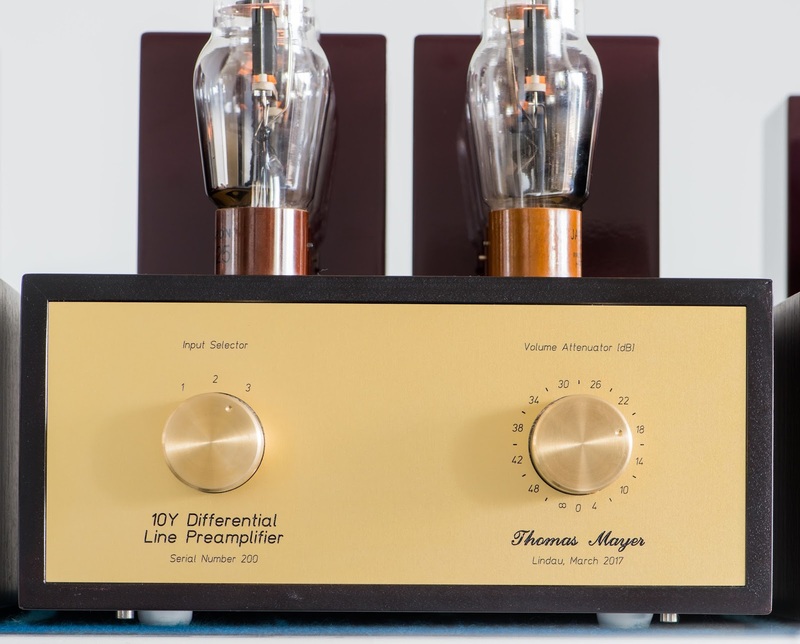 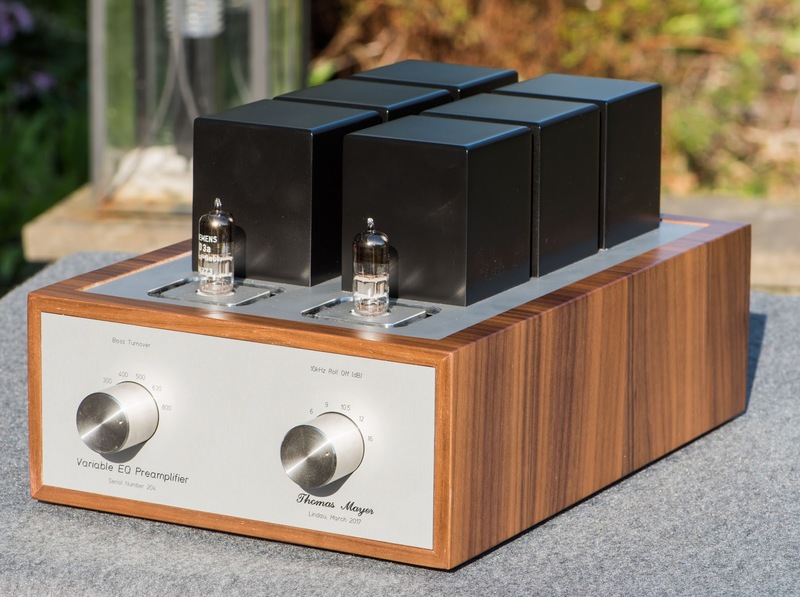 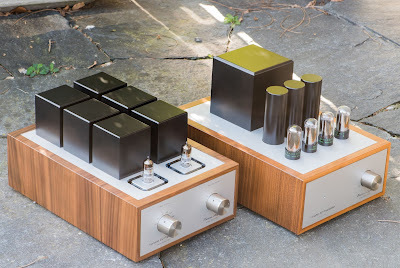 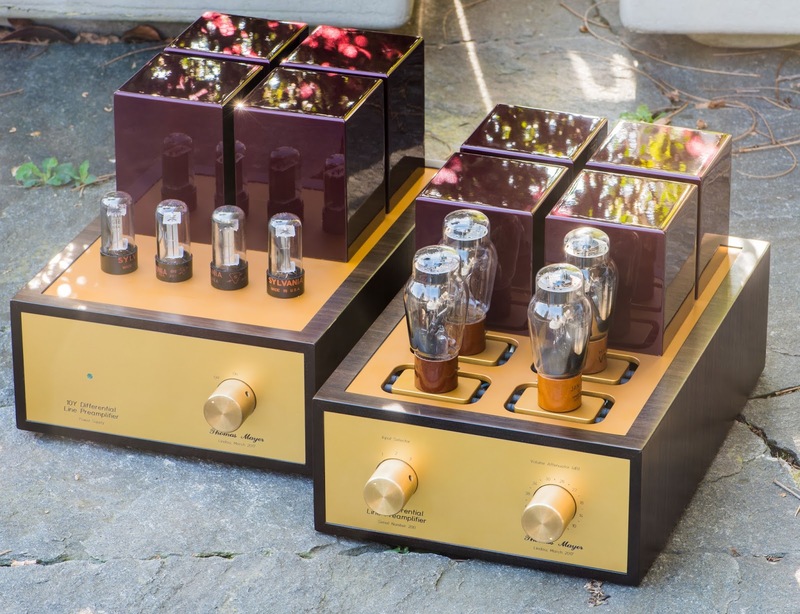 Come to the High End fair in May to listen to this preamp. 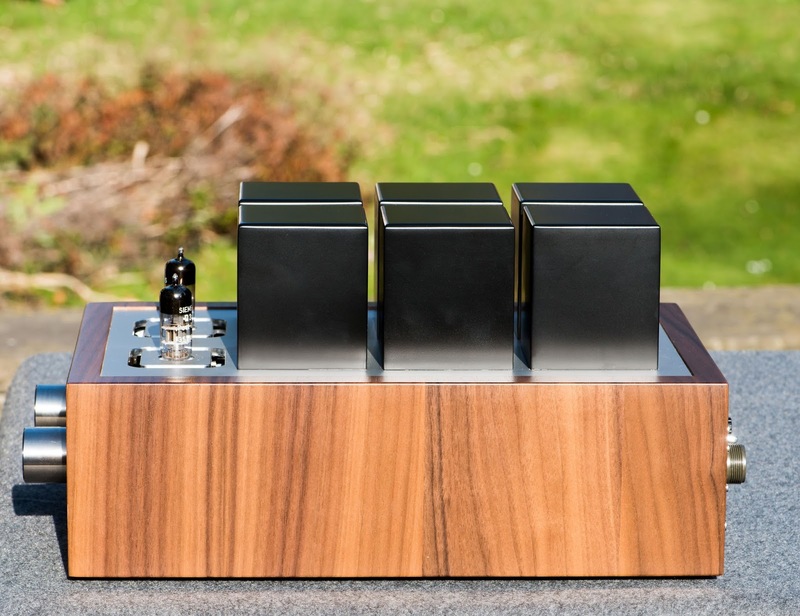 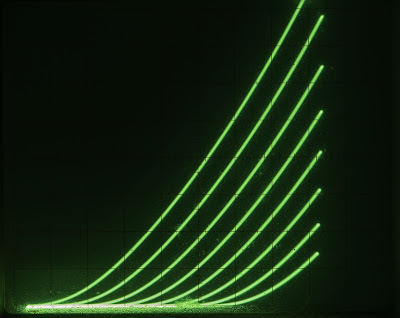 Stay tuned for more info about the system which will be shown in Munich. 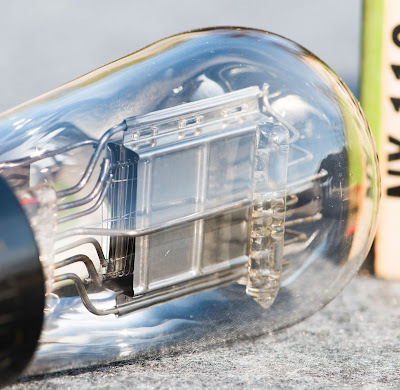 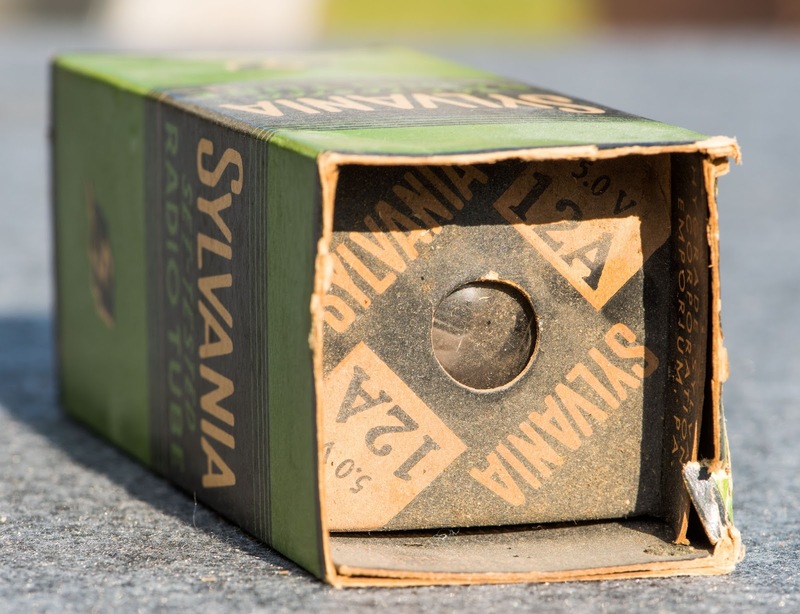 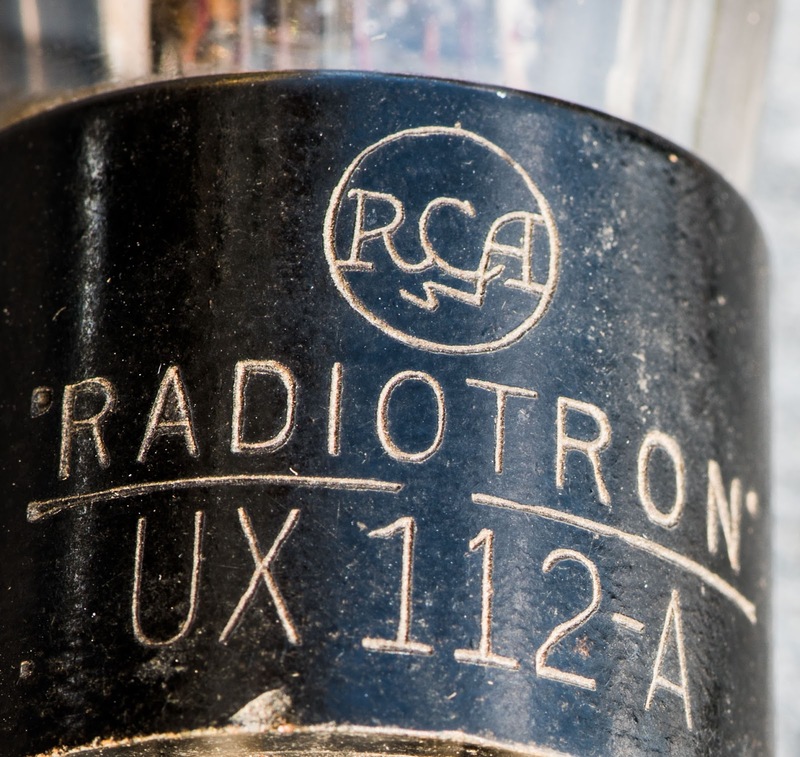 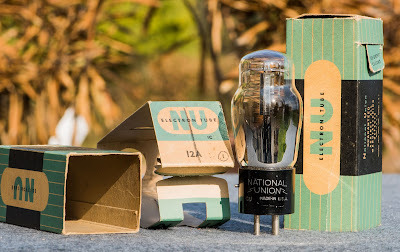 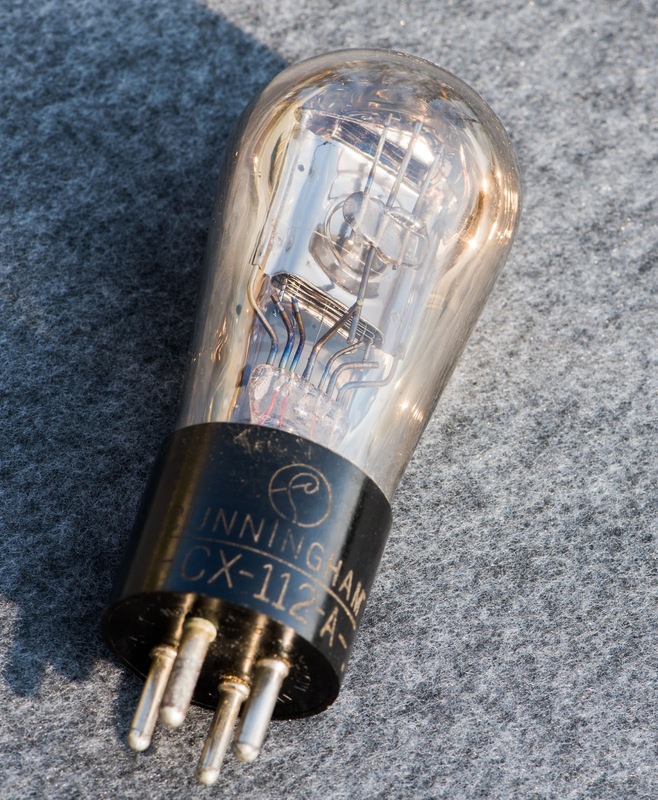 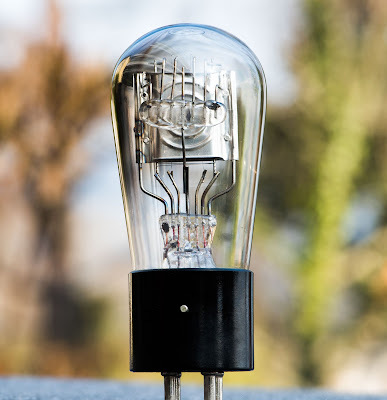 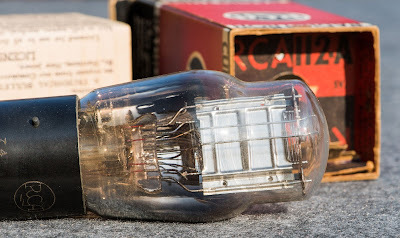 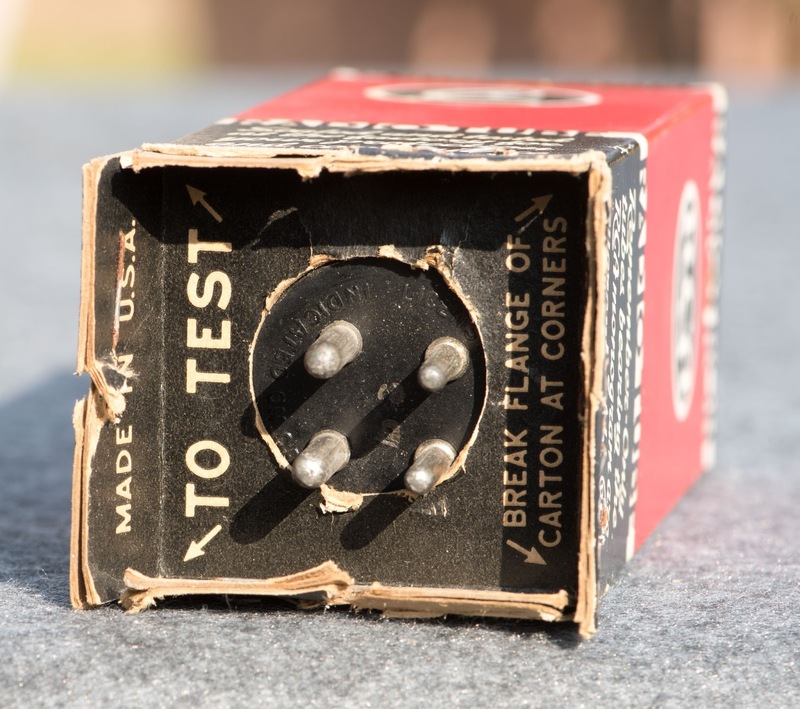 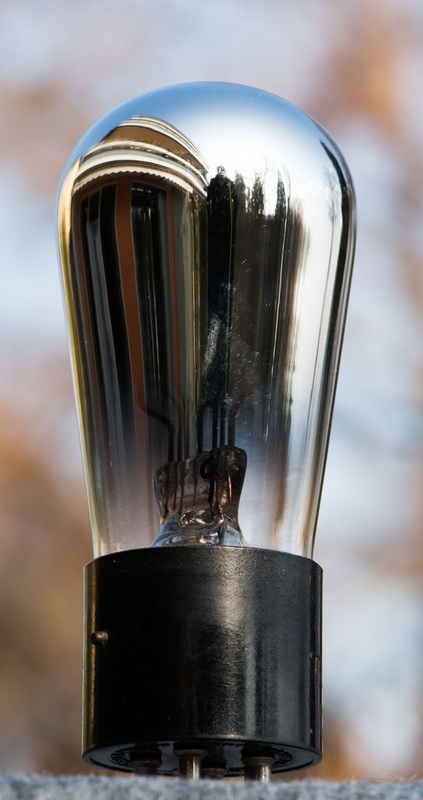 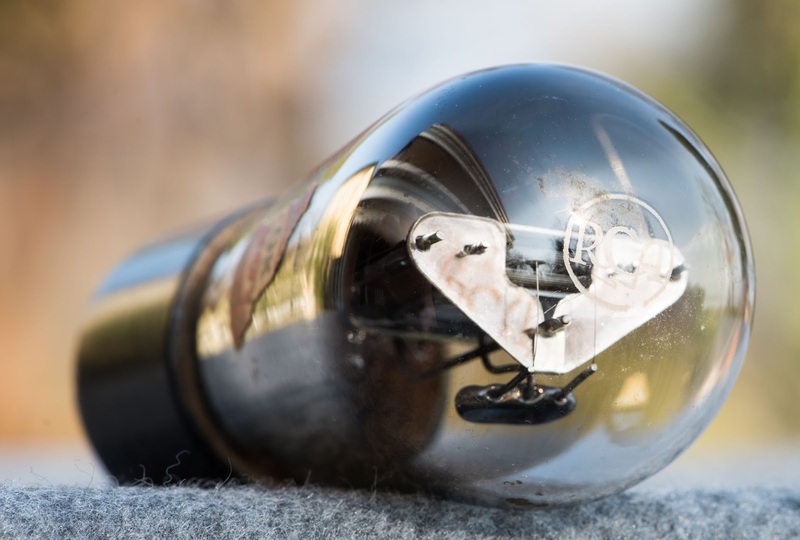 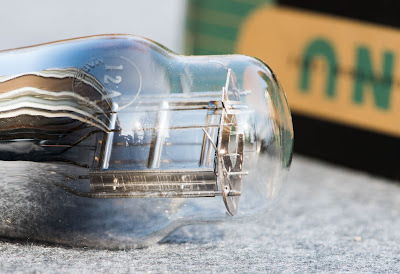 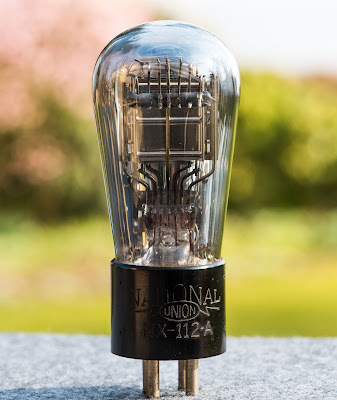 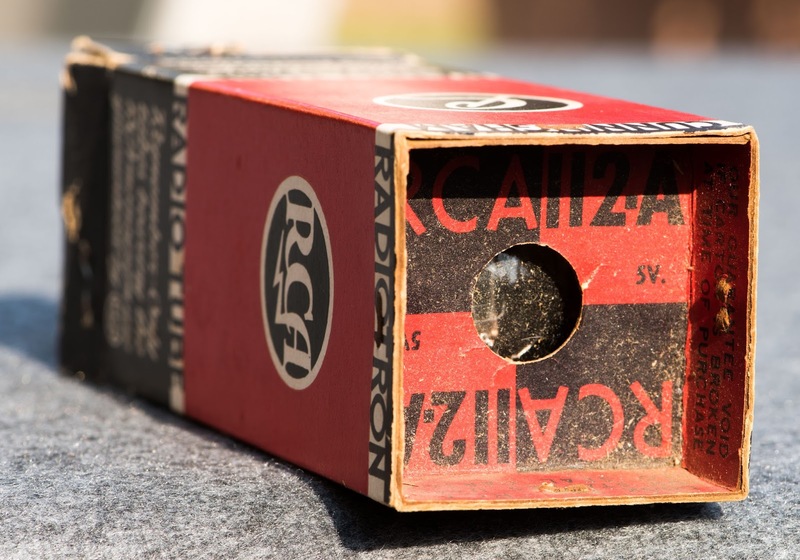 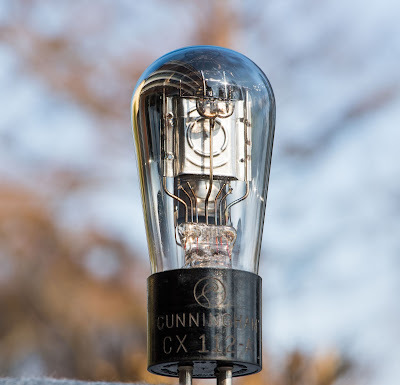 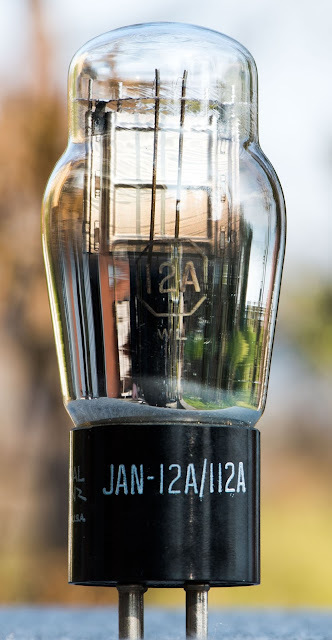 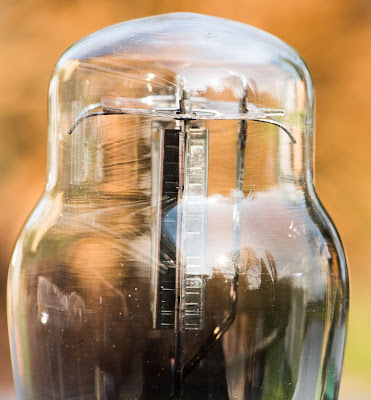 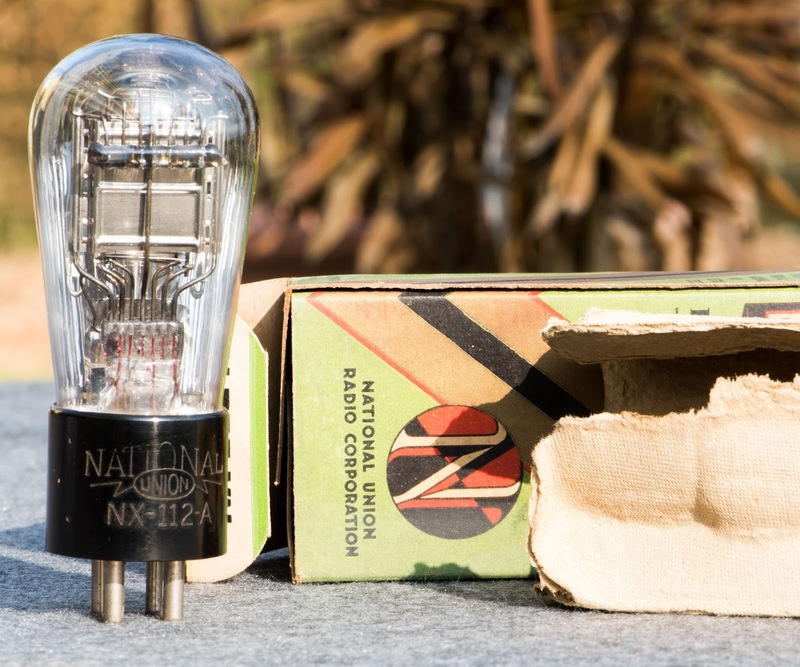 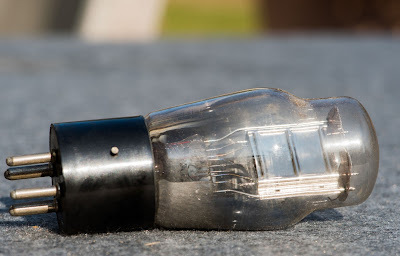 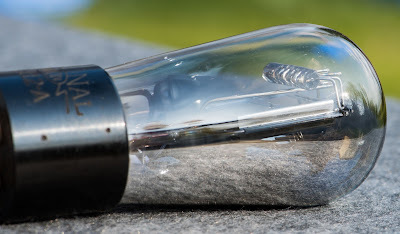 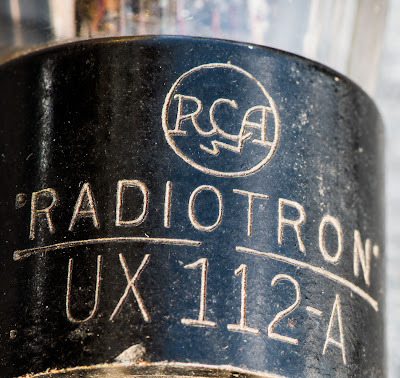 After the presentation of the rather modern tube last month, I will take you back all the way to the 1920ies today with the presentation of a very early triode, the UX 112-A. 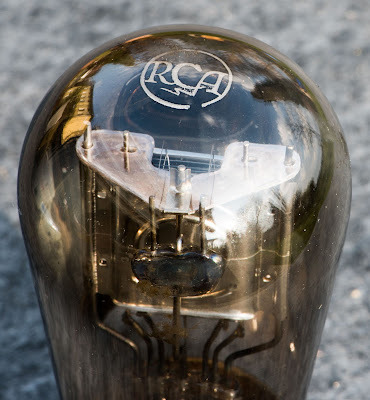 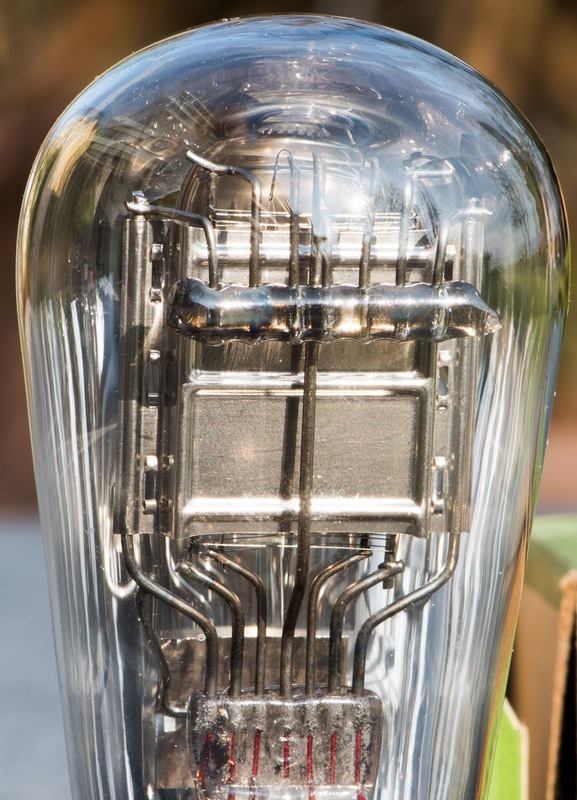 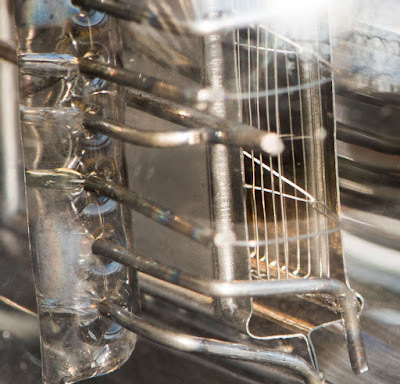 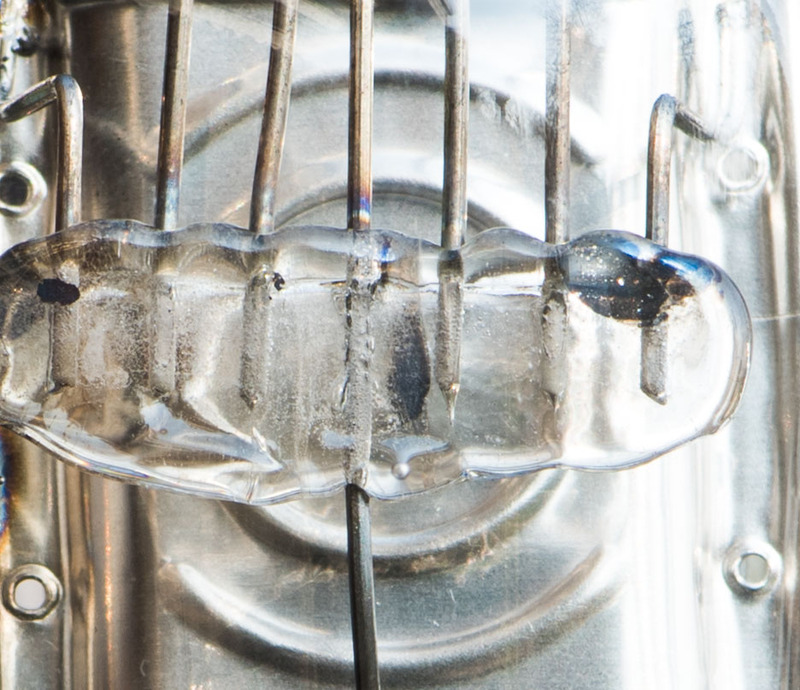 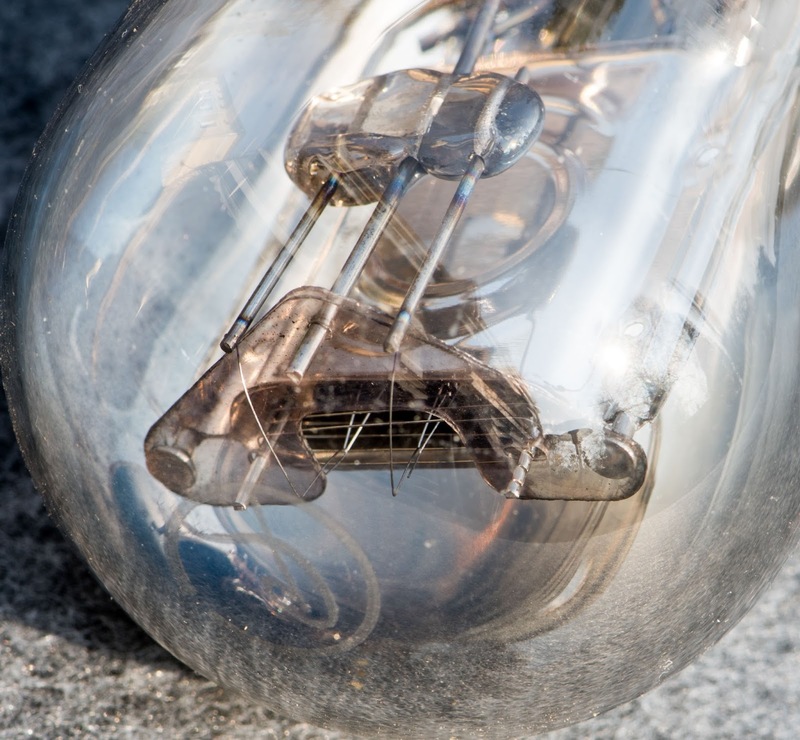 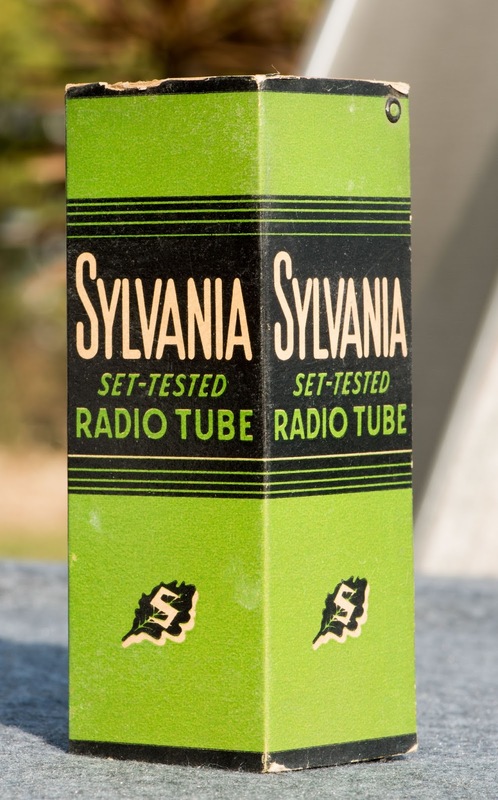 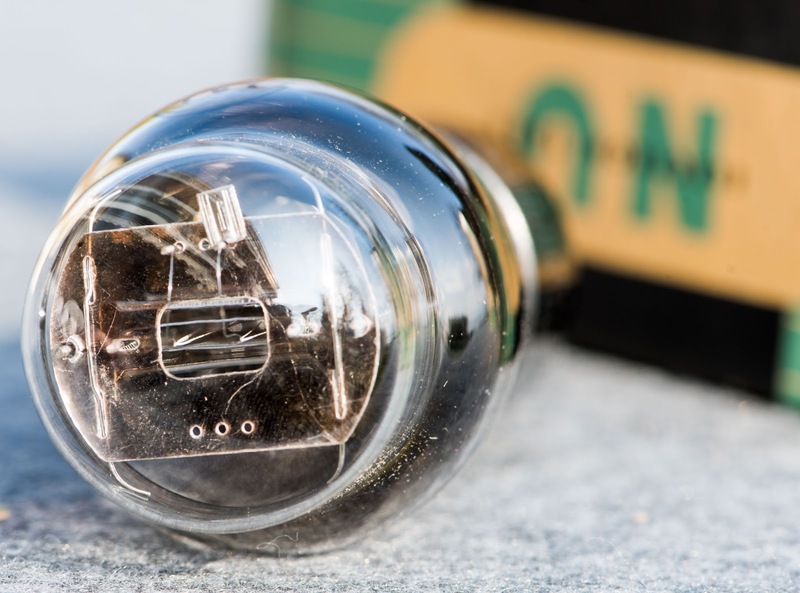 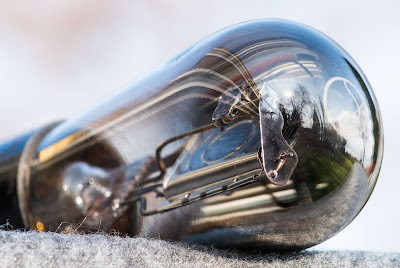 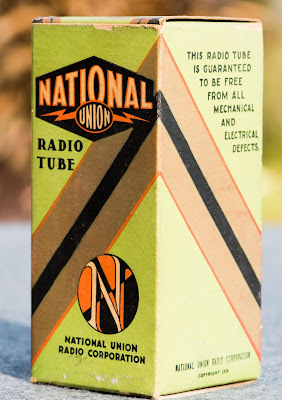 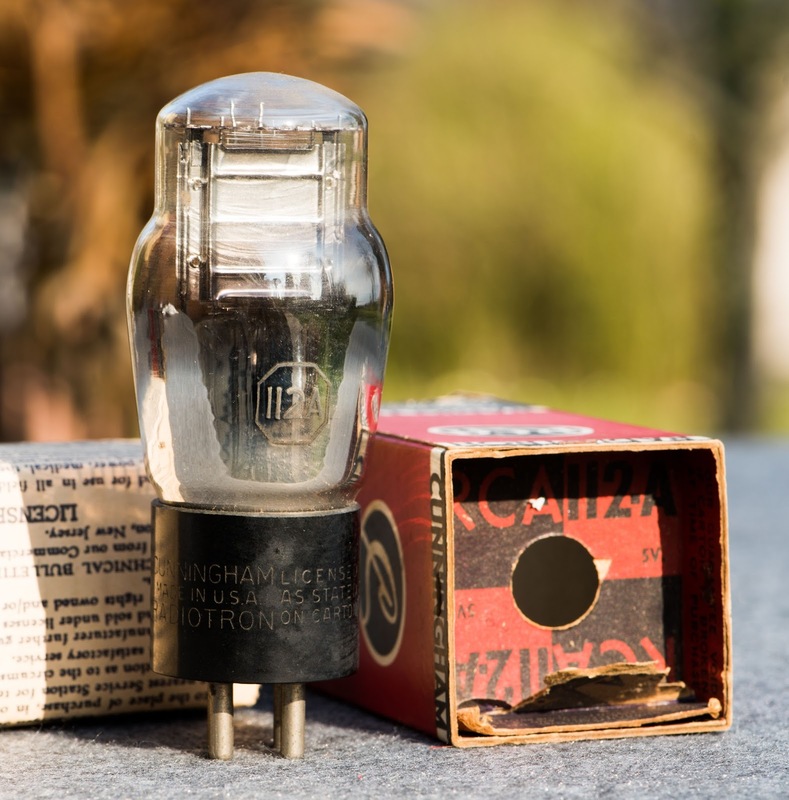 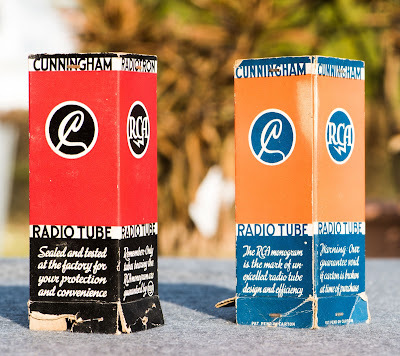 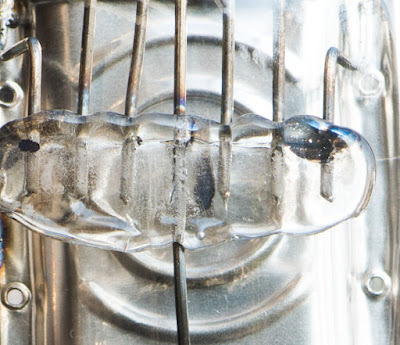 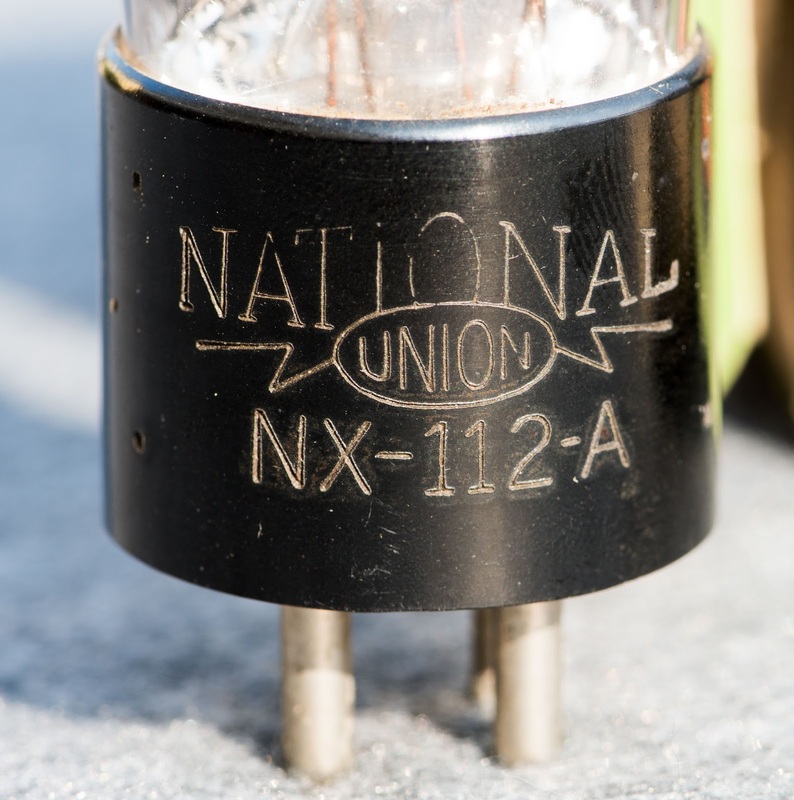 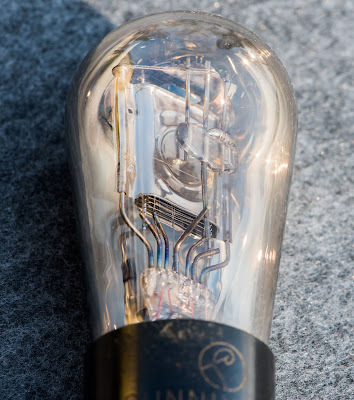 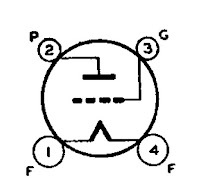 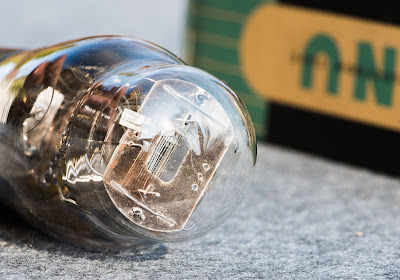 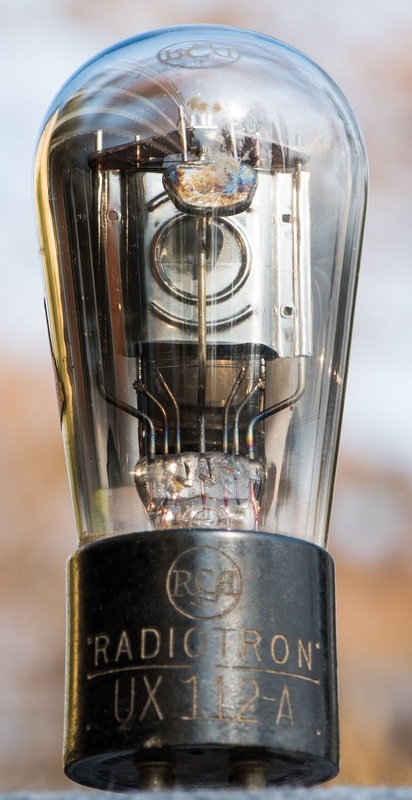 This tube was introduced as detector and amplifier triode. It was meant as an improved version of the UX201A. 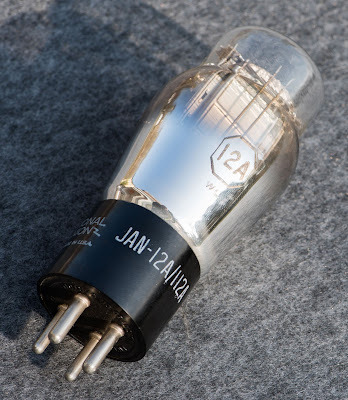 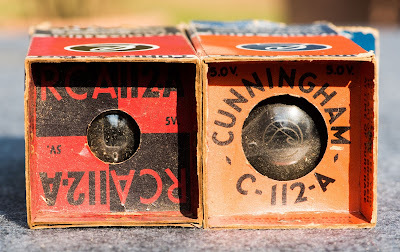 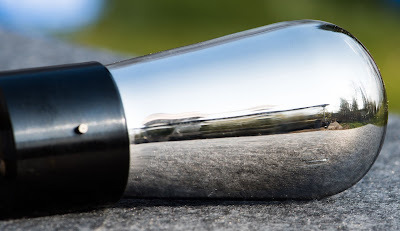 While the UX201A was made in large numbers and can still be found rather easily, Less UX112A tubes are around nowadays, but still not impossible to find. 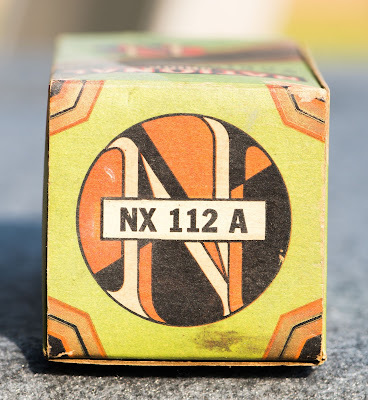 Here some 112As from my stock. Here we have a beautiful Cunningham CX-112-A. 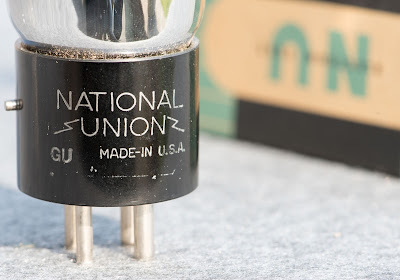 These dropped the 'UX' prefix. 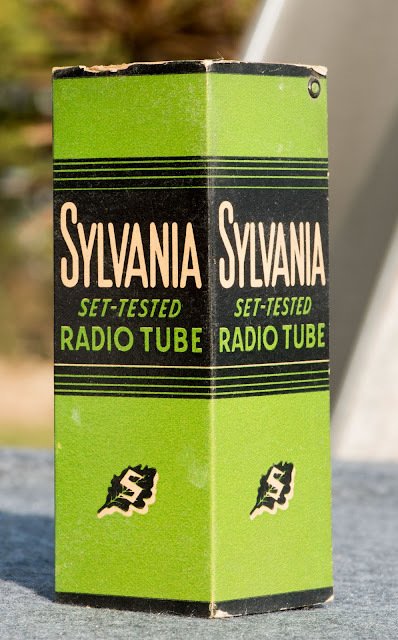 Nicely sealed box which allowed testing of the tube without breaking of the seal. 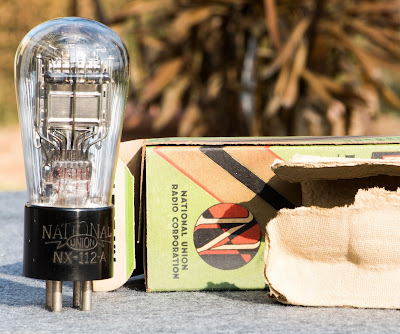 These already have the more modern ST-shape. 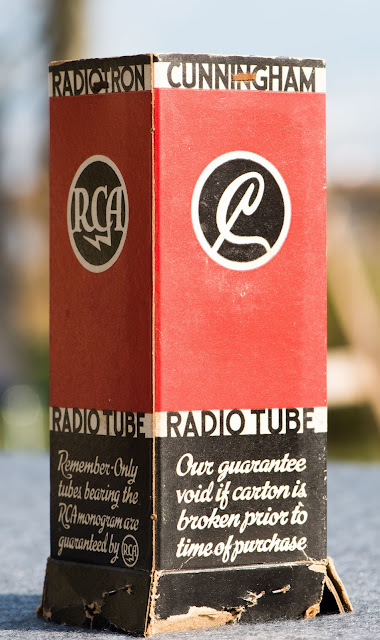 Beautiful coloured box and gorgeous globe shape tube. 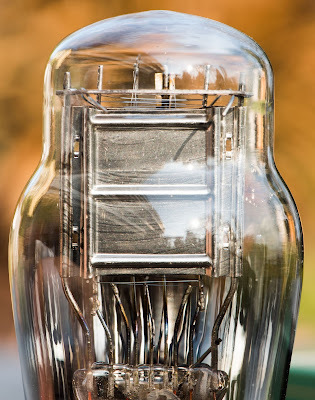 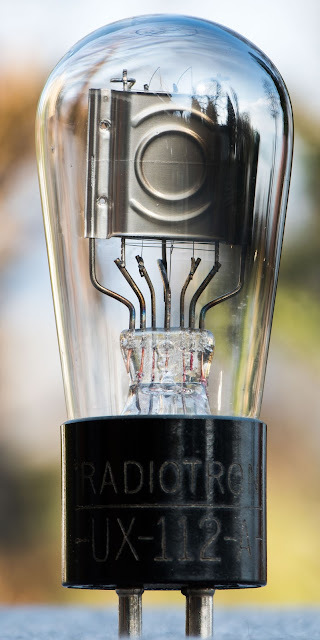 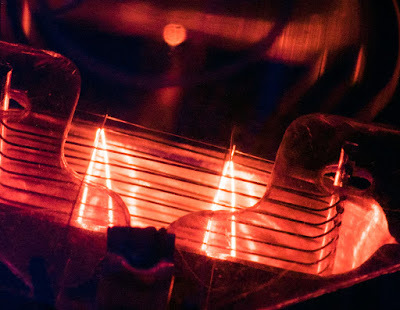 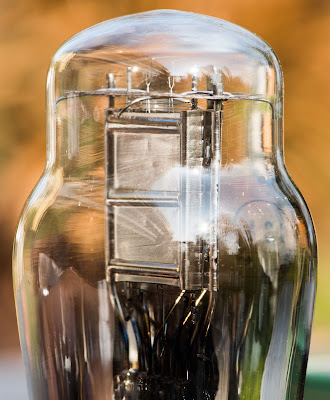 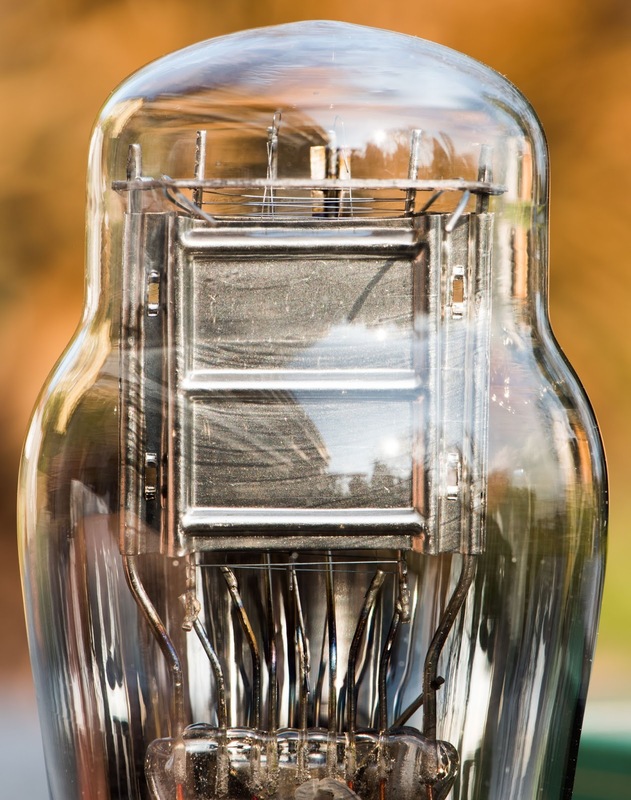 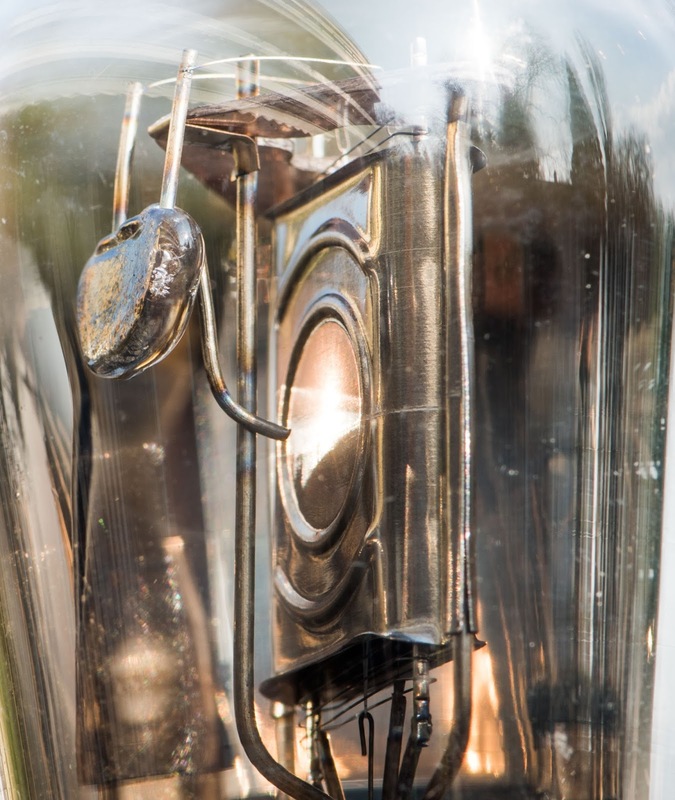 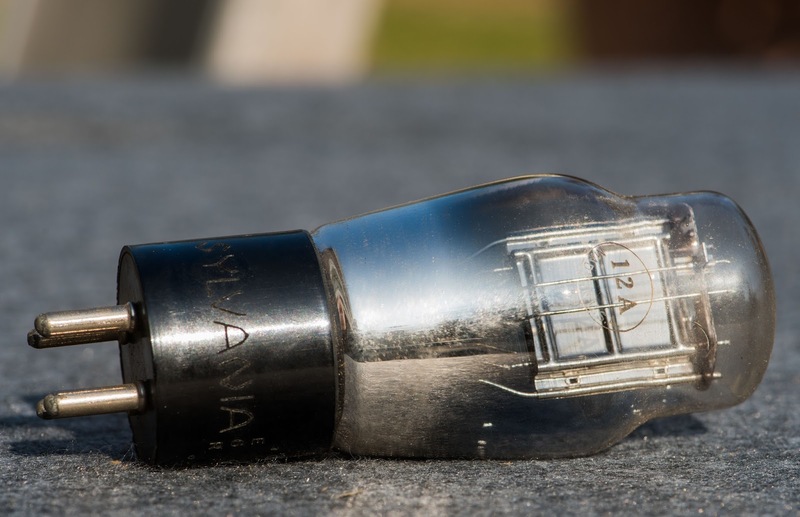 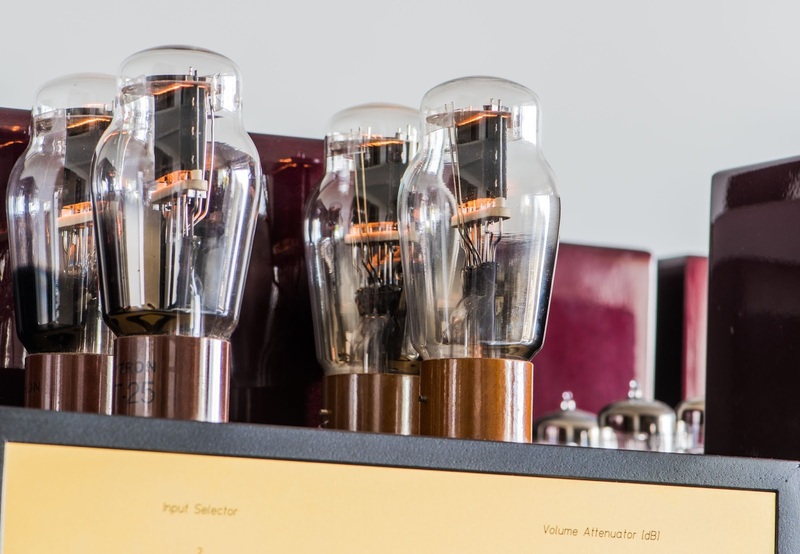 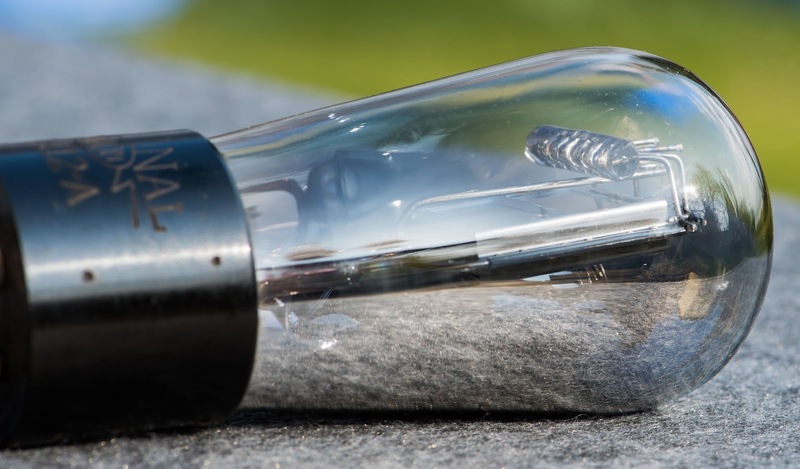 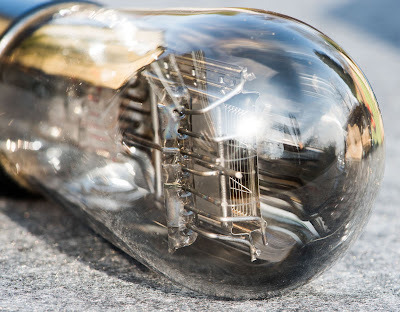 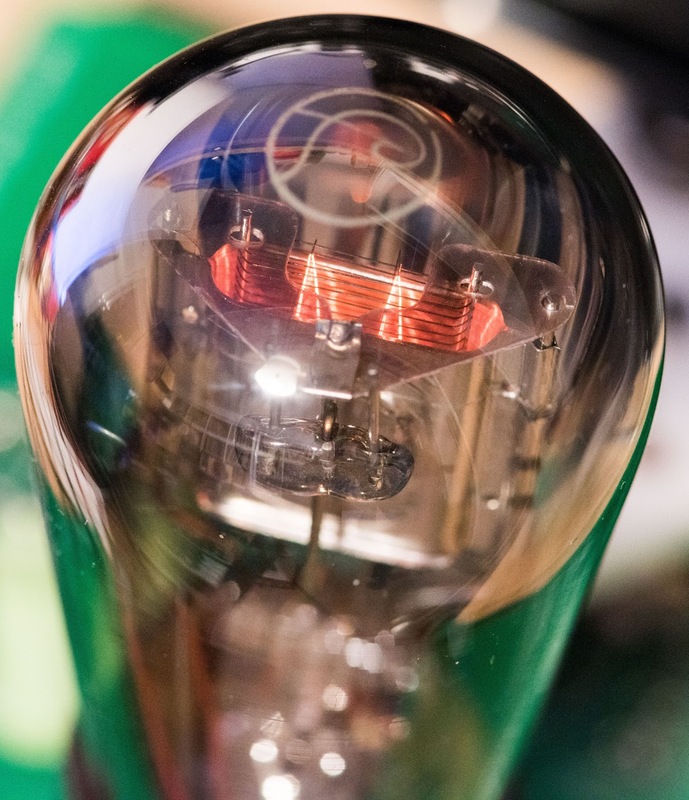 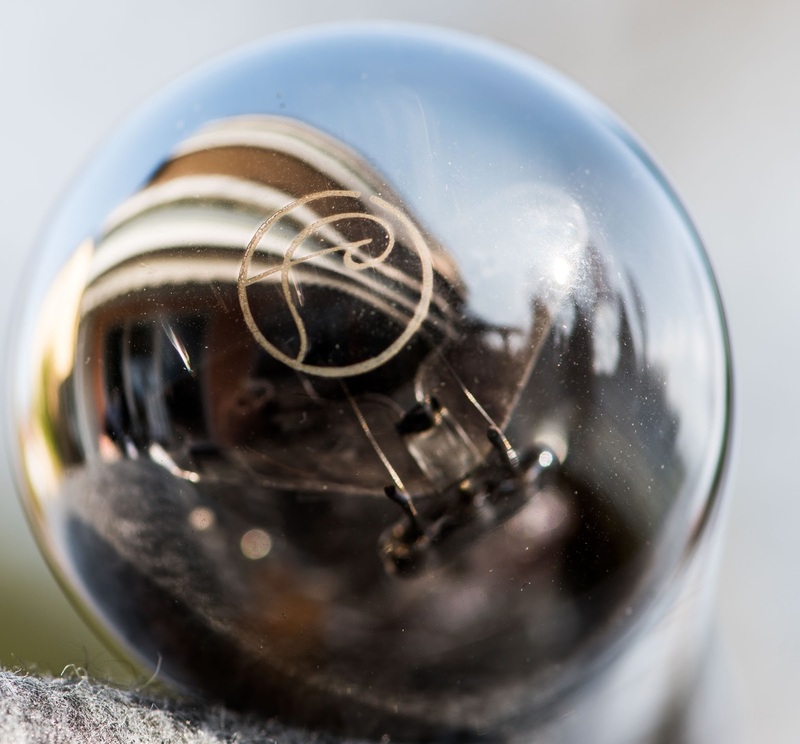 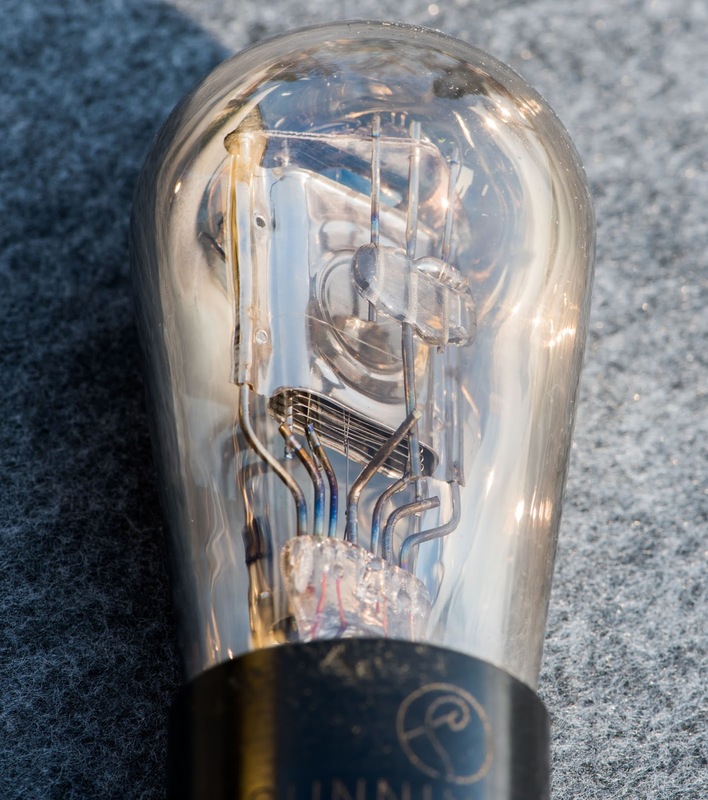 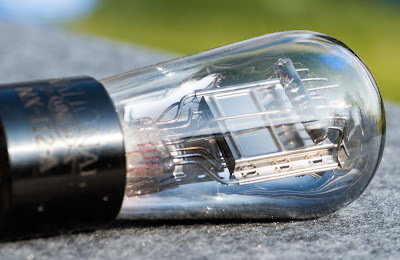 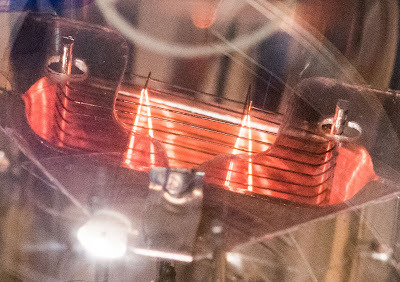 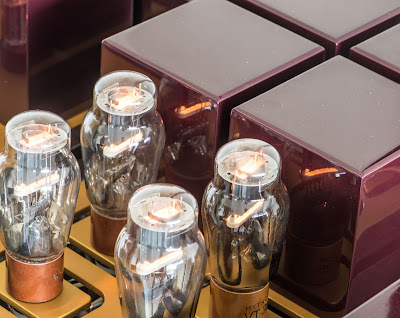 That's all for this beautiful triode. I hope you enjoyed the journey back to the 1920ies.